My knitting has solely been focused on this summer top. I worked on this beauty the entire trip up to Boston getting the lace detail finished. Now I'm on the stockinette stitching which to me is soothing and calming. I find if I feel hectic on the inside, stockinette stitch gets me into a zen state of mind. My other projects have taken a back seat while I obsess over this current knit. simply stunning - I can completely understand why you're addicted to it!! That is so beautiful and will be amazing. I agree that simple knitting can put you in a Zen state. Very meditative. Love the shade of purple you are using. I like both the design & the color, it will be a beautiful top! That beautiful purple would draw me in too! That top is going to be so beautiful! That is gorgeous! And, I love your yarn choice! Here is to some speedy knitting (which it looks like you are doing!!) and a beautiful summer top! I love summer tops. They're some of my favorite knits. 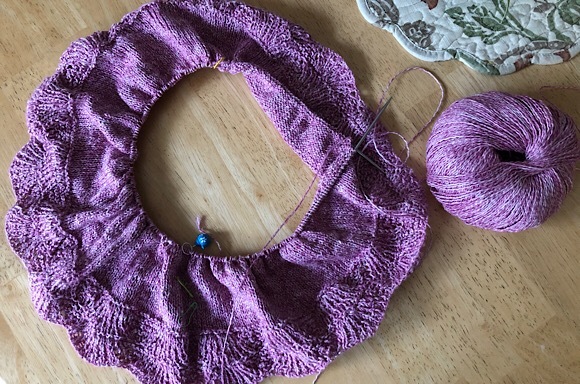 The best is doing the tricky lacy bits first, then smooth sailing to the finish with stockinette. Enjoy! I don't have any other words besides gorgeous, gorgeous, gorgeous! I'm anxious to see this finished, but at the same time, I understand how relaxing a knit it must be. Enjoy! That lacy shell edge detailing is beautiful. I didn't notice it when I first looked at the Ravelry picture. You are making swift progress. Great combination of yarn and color! That is darling pattern. I am glad to see there aren't nettles in the yarn! Some years ago, there was a yarn with nettles -- and it wasn't very soft! Beautiful, the lace detail is a real delight. That top is going to be so much fun to wear. The yarn looks so summery and cool. I love the project. Keep on knitting! And yes, sometimes I am amazed how knitting a simple stitch calms my soul. Garter stitch is what does it for me. You are zooming along on this Tegna (?). What a fun color also. 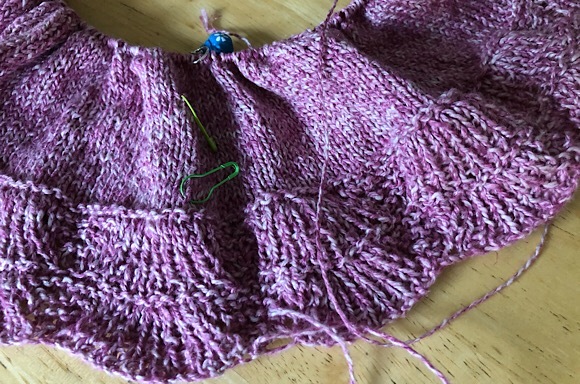 I can understand how stockinette stitch is soothing. For me it's the feel of the needles in my hands and the yarn running through my right. It's like eating comfort food or reading a favorite book.